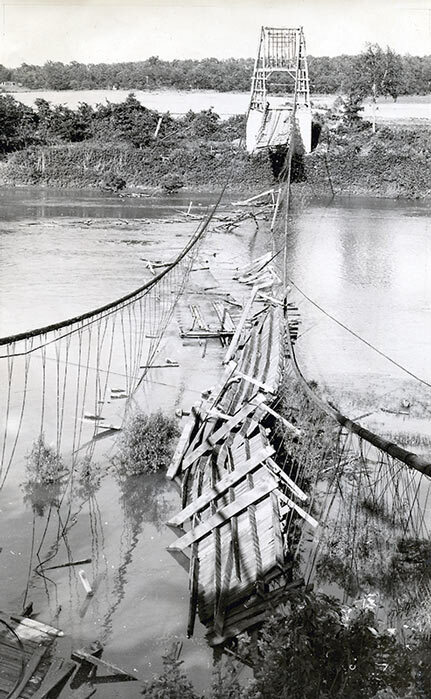 On June 21, 1940, the aging Brown’s Ford suspension bridge collapsed. The bridge went down as Mr. Bledsoe and others were working to repair it. 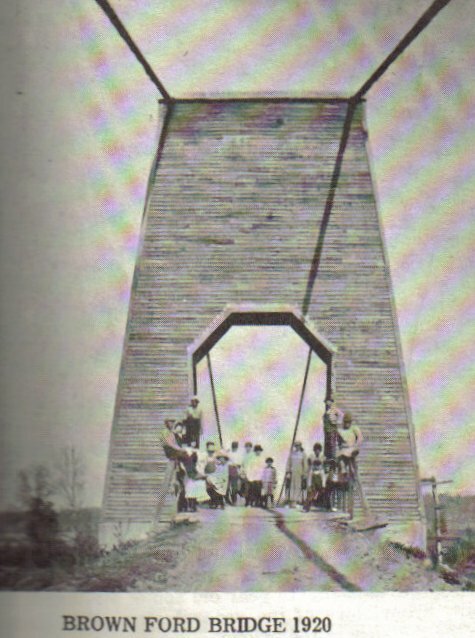 E. A. Bledsoe, who had designed and built the structure almost 30 years before, died on his bridge. One of the most tragic accidents in the history of the county occurred Friday evening when the cribbing supporting one of the piers on the west end of the Brown’s Ford bridge collapsed causing the suspension cable to give way, taking the lives of five people, three men and two boys. Three others were injured. The dead were E. A. Bledsoe, who had charge of the repairing of the bridge, Claude Terry, 45, a workman, Robert Shaw, 18, another workman, George T. Randall, 16, a bystander and Lloyd Allen Snyder, 12, who fell in the river when the bridge collapsed. The injured were Lowell Smith, in the Appleton City hospital whose condition is reported as still critical, Edy Snyder in the Clinton hospital where his condition appears to be somewhat improved and Wayne Snyder a bystander who suffered a broken arm. The cause of the collapse of the cribbing probably never will be known. It was one of those accidents that occur even when the best of care and precaution is taken. The heavy timber that had been used to build up around the old piers were strewn about like so many match sticks, and it was these timbers that caught the workmen with crushing force. There is a report that someone heard something ‘pop’ and called Mr. Bledsoe’s attention to it. It is said that he climbed up on the cribbing to investigate. Just then the whole thing gave away. Mr. Bledsoe was crushed in the falling debris, and the fact his watch was stopped at 3:31 indicated that was the time when the accident occurred. All of the dead and injured were recovered shortly after the accident and removed from the wreckage with the exception of young Lloyd Allen Snyder. His body was not recovered until Monday evening when Bert Milam of Warsaw discovered the body floating down the river along with lumber and wreckage from the bridge. The distance from the scene of the accident to the point where the body was found is estimated to be about sixty-five miles. Mr. Milam notified Benton county authorities and Prosecuting Attorney Frank Brady telephoned Sheriff R. Homer Gerster, who immediately sent O. S. Hull, Jr., to have the body identified and return it to Osceola. The Brown’s Ford bridge was built about 25 years ago by Mr. Bledsoe and Ira Alspach. It is one of the quirks of fate that the bridge should claim the life of one of its builders while in the process of repairing the structure to strengthen it. The old wooden piers that had been erected at the time the structure was built had become dangerous for traffic and it had been the plan to replace these piers with steel beams that would support the cables and the heavy weight of traffic upon the structure. For the past years the bridge had been condemned and not more than one car was allowed on the structure at a time, for fear that it might collapse. The wooden cribbing was used around the old piers to enable the workmen to jack up the cables and get them slightly to one side, the after the wooden structures were removed the steel beam was inserted in place and the cable then lowered into position. It is believed that one of the jacks used in raising the cables had given away allowing the cable to fall back onto the cribbing before the workmen were ready to lower it into position. This threw the weight of the entire bridge structure suddenly upon the heavy timbers, around the piers and the cribbing crumbled under the impact. What is to be done about the bridge is not yet known. The county court will hold its regular meeting next week, at which time, no doubt it will be determined what is to be done about the old structure and whether a new one will be erected to replace it or not. A replacement suspension bridge was built. It was just as scary to drive over with the slats rattling under your tires, but it never fell in on its own. That bridge was replaced by a modern concrete and girder bridge when Truman Dam was built.